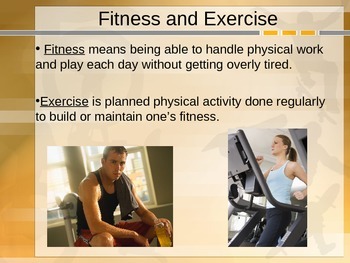 The purpose of this PowerPoint is to teach students the differences between health and fitness, definitions of aerobic and anaerobic activity, benefits of physical activity, endurance, strength, flexibility, and four ways to measure fitness levels. 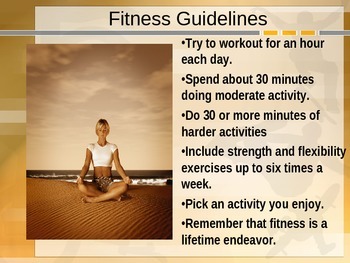 Using cross curricular methods, students are asked to relate these to fitness tests in physical education classes. Part two consists of goal setting, target heart rate, implementing goals into action plans, safety, warm up and cool down as well as tracking plans! 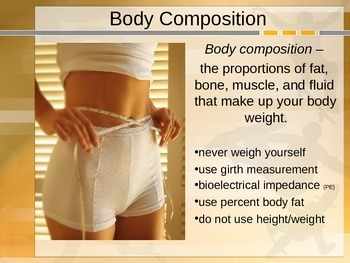 Part three consists of weight training and the benefits of weight training and safety. It discusses illegal substances as well as supplementation, athletic role models who have used performance enhancing drugs and consequences of overtraining and injury. 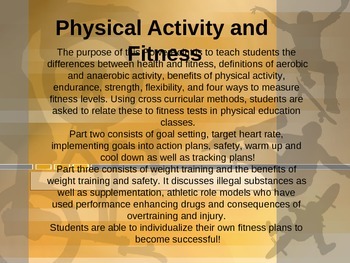 Students are able to individualize their own fitness plans to become successful!